I used to have high, high hopes for my novel Nevdroonia. Such as having it entirely finished by now. Such as having it edited by now. As many of you know, many things have been going on in my family, and in addition to that I have an incredible amount of schoolwork. Whoever said that homeschooling must be easy don't know a thing. I put in seven to eight hours of hard work a day-- no sitting in boring lectures or chatting to friends by the locker or watching movies in class. 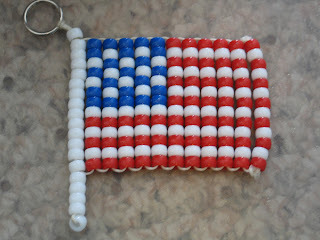 I've been escaping more-- reading or doing simple art/craft projects in my free time. As a result, my writing has suffered. I am only 80% done with Nevdroonia. I finally got over a huge writer's block, when I couldn't figure out what would happen next. (You see, I started this project with no definite end or outline, something I'm not likely to repeat on a full length novel). I now know how the climax will work. But if things carry on in the way they have been wont these past few months, I won't be done by next NaNoWriMo. Arugh. I've always been facinated with Fair Isle knitting, where different colors are switched in and out of a project, often with facinating results. Through... well, I wouldn't call it stubborness, but for some reason or another, I've never actually learned to knit. And I really, really wanted to do this Fair Isle thing. So I learned about Tapestry Crocheting! I used THESE INSTRUCTIONS. The website has some videos that I'm sure are helpful but that I haven't watched. I first started with a little iPod case, but I did it in the round with a complicated knitting grid and it didn't really turn out. The nice thing about tapestry crochet is that switching yarns is easy (provided you twist before you yo!) and it is two sided. I crocheted William a new Gryffindor scarf! I did it in double crochet (as opposed to the previous hat I made) and did it while watching the Olypmpics. Its five feet long!!! After my first night of crocheting! Unfortuneatly I had to tear the bottom bit out, because it was too large (I had it sewed down in this picture). 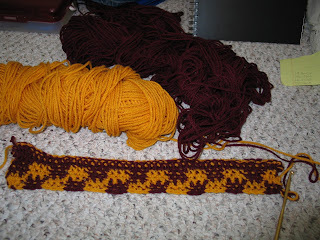 And I certainly didn't crochet as much the following nights. 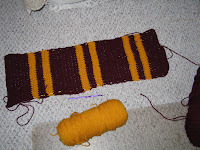 Why did I need to make a while new scarf when I had a perfectly good one I made last year? Was it because I wanted one for myself (which I kind do)? Rosie had the cutest pair of bermuda jean shorts. They had a little design on them with a palm tree. She decided she would practice the splits. While wearing them. They riiiiipped down the leg-- not even on the seam! I thought it would be a shame to let those shorts go to waste. I cut the shorts along the jeans, up to the crotch. I had to cut a little extra where she tore them. Then I cut out two triangles from yellow material, hemmed it, and sewed it on the front and back of the jeans. Maybe my sewing skills aren't so terrible, after all! After my last post, where everyone seemed to think I drew a self portrait, I decided to see if I could draw a self portrait. 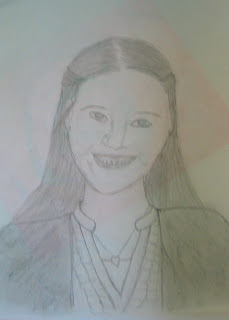 After all, my 'drawing-people-so-they-actually-look-like-themselves' skills are terrible. Gahhhhh. *buries head* Why am I posting this? I spent, all of twenty minutes on it. Maybe less. And I'm not exactly a pretty model... its so much easier to draw nice sharp noses, you know! I drew this picture at an angle-- I was in the bathroom (what you see is a mirror image!) and the counter was too wet to put my sketchbook on. The angle I drew it at looks better. Oh, if the glasses look cricked and falling down my nose, that's because they are. They are five years old and have been in too many volleyball games. Ooooh, pitiful... I did draw a much better one a few weeks after this one, but that picture is packed up. And this next one was not drawn by me at all! 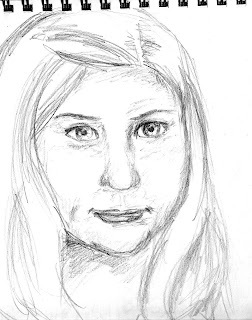 My friend, Yaviel, drew it based on the picture in my facebook profile. She said it was the best drawing of a face she's ever done. It was so sweet of her to send it to me! Let's all hear a round of applause for Yavi, shall we? I didn't scan this... sorry for the picture quality. I didn't make this to be a self-portrait. It doesn't look like me at all, to me. 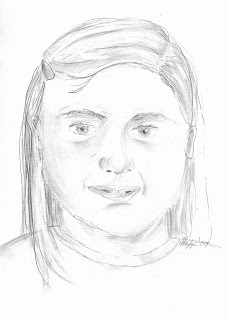 I drew it as a random person from my imagination. 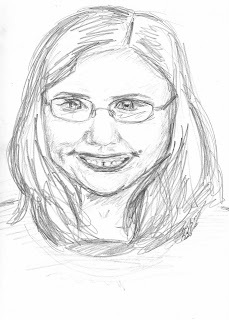 But my little sister, who watched me sketch this, said, "Oooh, Shaylynn, it's you!" Today my toddler brother, who loves going through my sketchbook and looking at all the "purples" (colors), came to me, thrust it in my face, and said, "Zay-zay! Oo!" My other brother heard, and said, "You didn't do a very good job making it look like you. You should put glasses on it." I thought that was funny so I scanned it in to tell you guys. While I was writing this, another brother came in and said, "Why've you got an unfinished picture on the computer? Uh, who's that? That supposed to be you?" When we first moved to R., we got some paintings to hang on the wall. They were right next to the windows and got terribly faded. I painted over them (adding my own little changes) a couple years ago. Going over two old paintings was very good for me-- it helped me realize that painting is not so difficult and set me off on a painting craze. I found WIP pictures in an old file. Enjoy! Here you can see one painting done (I have since finished it better) and the other faded painting. Both have been entirely finished for awhile now; must find a picture. EDIT: Pictures of the finished paintings-- I finished the last one a year ago. I found these in a pictures file. They are from last year's Valentine's day. I made Valentines for all the girls involved in The Pirates of Penzance. The picture should give a clue to how many there were acting or working backstage. :) I used Mom's Stampin' Up! stamps. Once upon a time, fairy-making was a favorite hobby. I remember writing about it three separate times in 4th grade English class. I have (in storage at the moment) a bag full of around 20 of them. They used to dangle from strings on my ceiling. I made this one recently for my sister. I will not post the instructions, seeing as I got them from a book myself. The book/craft kit does a wonderful job explaining. The book (a newer edition than what I used to have!) can be found HERE. Once you know how to make the fairies, you can get extra supplies at a craft store. I helped my sister make this necklace! It has a rose button (because her middle name/nickname is Rose), a Miraculous Medal, a key (which is actually mine but she insisted on using. Apparently it is magical and can unlock any door or treasure chest), and two pink beads (because pink is her favorite color). The pink leaf at the bottom is just because its pink. She wanted to put so many things on it... :) I kept it down to five, any more would be far too busy. THIS IS MY FIRST EVER PIECE OF CROCHETED CLOTHING!!! And, for once in my life, I followed the pattern exactly. 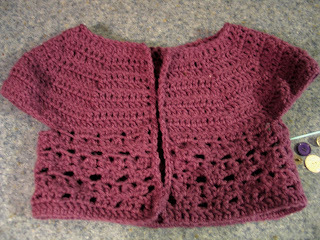 It is called Behop Cardi and can be found for free on Ravelry and Lion's Yarn. I had some confusion about the gauge (it accidentally gave two numbers! ), and had made a good part of it with the wrong gauge. 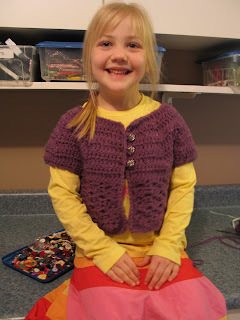 Rather than frog (tear out) that strip, I gave it to Addie as a lacy purple scarf. Overall, this went fairly well! Being a beginner, self-taught-by-web-browsing crocheter, I had some problems getting the hang of it. Considering I had troubles crocheting a straight line just a few months ago, I am quite proud. :) It only took four or five hours! And that is while reading/watching TV. Found this lying around; thought I'd share. Not sure what this craft is called, I strung beads onto two crisscrossing strings. Made it way back in second grade. 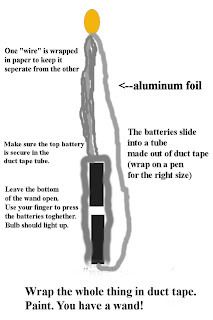 Remove the ink/nib from the pen. You don't want that exploding in the oven! Make a "holder." Use the pen to shape it, but make the whole extra-big, twice the size as needed. Put some unbaked clay into the "holder's" hole. That will let the pen stay put much better. Use until your ink runs out; pull out ink and put more in! These pens are remarkably sturdy. I've made around ten of them; the three above are the ones I haven't given away. The pen on the far left was my first ever. I made it five years ago, and its still holding up. It has a slight crack because I put a chair leg ontop of it one time, but still works. The middle was about three years ago, and I just made the right one a few months ago. Its much prettier than the picture makes it look. There is something about reading a detail-abounding book that makes you want to go and make all those neat gizmos and gadgets and whatnot. Also, watching the movies for the millionth time lets you notice the little prop details. I've already posted instructions on a light-up wand. 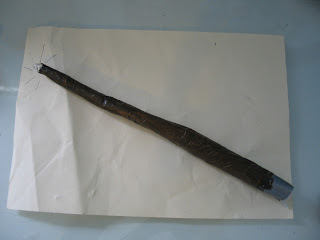 But for a more movie-accurate, lighter, and much easier wand, I suggest this method. First, take a sheet of computer paper and lightly coat with Elmer's glue. Roll the paper diagonally as tightly as you can. Allow to dry. Next, trim the ends with scissors. 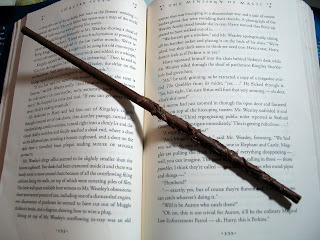 For wands like Hermione's, that have carved detail, use a glue gun to glue on the design. Then, paint with acryclic paints. If you glued a design, you may or may not want to paint the design in a lighter/darker shade. I'm sure you've seen the wands that nearly all Harry Potter merchandise sellers sell. The light-up plastic wands (so horribly overpriced). What you see in the picture is... rather confusing. But it holds hair back nicely, and is pretty. I did it for my friend before her basketball game, and it stayed in! Its two sets of french braids on either side of the head. The braids ended at the middle of her head, and I then pulled the rest of the hair into a single french braid with a ribbon in it. 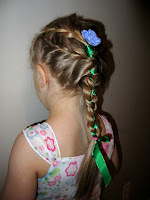 My favorite french braid so far is the one that looks like a circle crown. What is Amigurumi? I'd wondered that myself. 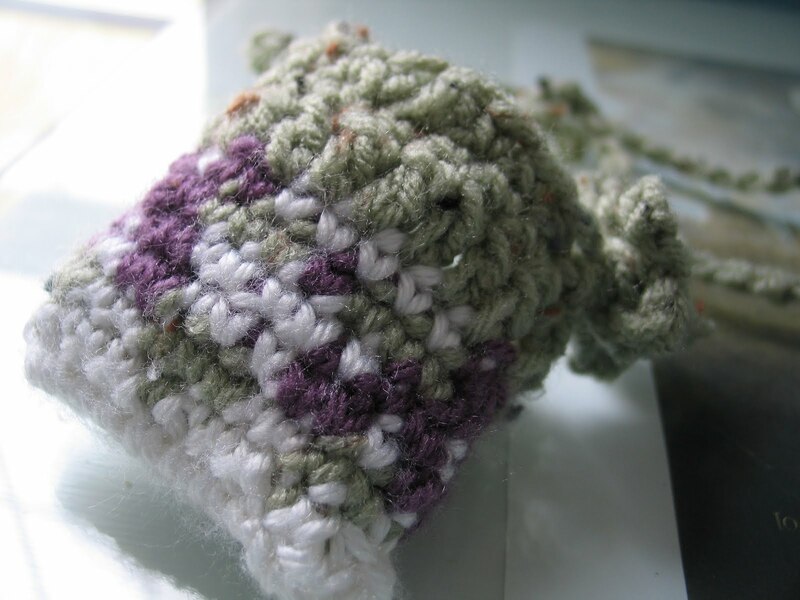 It is, apparently, the "Japenese art of crocheting small dolls or toys." On the Fairy Tale Novels Fourm, I was on an adventure with Yaviel. 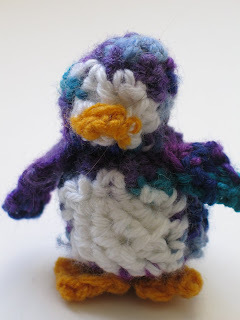 We metamorphed into purple penguins and got kidnapped by The Boss... well, long story short, I made a penguin for Yaviel! I'd seen some pictures of crocheted dolls on Ravelry, and thought I'd go for it. I pulled out yarn scraps and set to work! I did not follow any pattern (I didn't even know it was called Amigurumi, and had never done any pattern similar before). I think I will be trying Amigurumi again. Although I might actually spend the time to find a pattern and/or basic amigurumi instructions. You see, I got onto the computer with the intention of posting at least six posts, instructions and all. That would be just a small fraction of the crafts/art projects/etc I have done recently. I got onto the computer. Paint Shop wouldn't open up (and all of the pictures had bad lighting). Then, I realized I was on my brother's account and he doesn't have access to my files. And then I realized that my bedtime, one which I'd better not miss by even a minute, is in only a few minutes. I might/might not be able to post tommorrow. Can you all pray for my family? Especially early this week? This being the internet, and this being a public blog, and this being a public blog that more than just close friends read, I can't put up too much info. But prayers would be appreciated. :) Danke! 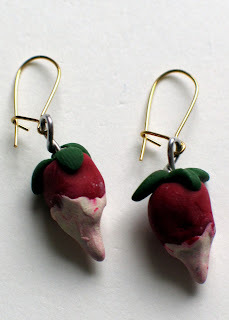 Luna Lovegood was the slightly-wacky girl... She wore a pair of beaded radish earrings (they are called dirigible plums in England!). These are not beaded... but they still remain very Luna. 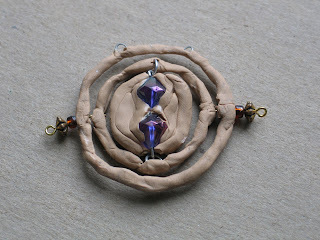 I made them with Sculpey clay, stuck a wire loop in the top, baked, and attached earring loops! The time-turner, minus the chain. Well, it's a bit sloppy... but it is a time-turner nonetheless. 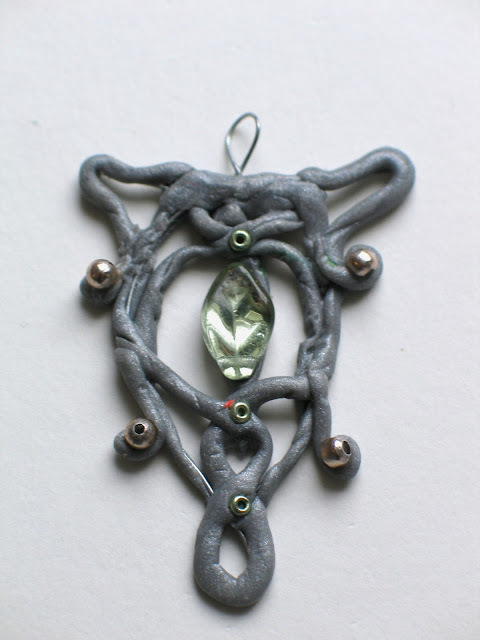 Best, all it took was some wire, a few beads, and Sculpey clay. AND it spins freely (well, until it decided to stop working). I just messed with the wire and clay alot. I can't explain how I did it; I bet there is a much better way. Mine was rather ineffective. It pales in comparison to the real thing... Oh, well. :) My bros sure don't care! It looks inconspicuous enough, except for the fact that it is Harry Potter themed. An envelope (which I wish I had "weathered") displays a very precise address (which is smeared in the picture). It reminds one of Harry Potter's acceptance letter: Harry Potter, The Cupboard Under the Stairs, Little Whinging, etc. Other themed papers are in the stack-- a letter from Ron, a parchment from Hermione, a Howler, and a page from my brother's HP journal. All tied together with a fitting piece of brown cord. 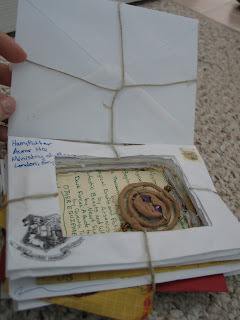 It opens up, revealing a letter from Harry at the Auror HQ.... and... a box! And on the bottom of the box is a copy of the First Year Hogwart's booklist. I wanted to make a hidden book box, but lacking a nice book ruined enough to use (since we cleaned our our bookshelves), I realized I had to improvise. So out came several envolopes, bits of paper, a printed page of the Daily Prophet and The Quibbler, etc. 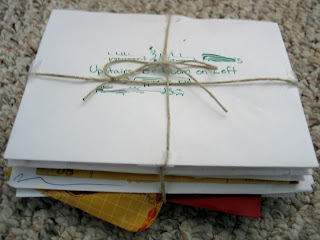 I stuffed the envolopes with old paper that hadn't yet made it to the recycling box. Then, I glued it all together. I made sure that the glue spread far enough that the box wouldn't affect it and small enough that you could still read the bits of paper. Then, I took the Xacto knife and cut out the box! It took far too long, because I had a very dull blade. I then coated the edges of the box with glue for added stability, tied the string around it, and voila. Almost any familiar with Harry Potter will remember the Golden Snitch, a key ball in the game of Quidditch! 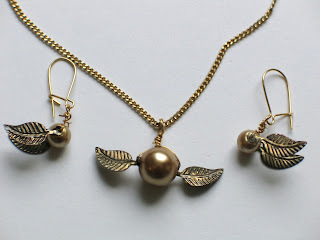 I made a jewelry set based on the Golden Snitch. It is fairly simple. Next, I took some floral wire, threaded the beads (a pearl sandwiched between two feathers/wings), and tied it into a loop at the top. 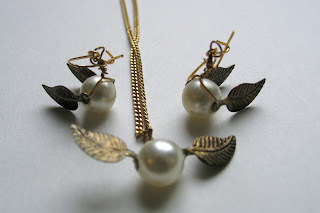 The wings can be spread out, as I did for the necklace, or left side-to-side, like I did for the earrings. If the wing beads flop around the wire, hold them in place with a few daubs of clear fingernail polish. In addition to the clay Gold Evenstar, I have made several other Elvish clay creations based on the Lord of the Rings movies. 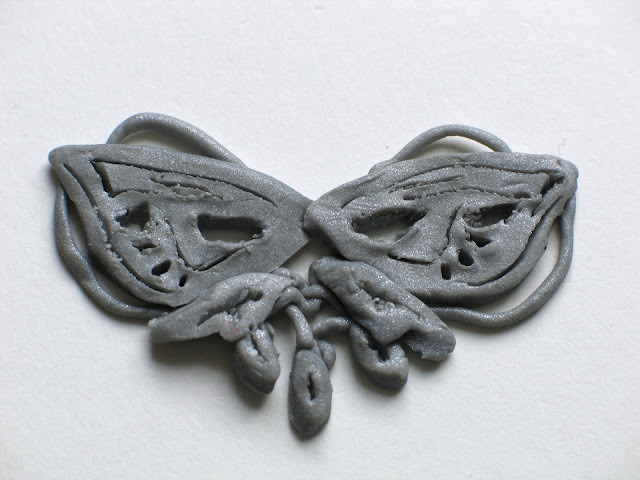 To make these, all you need is some Sculpey clay. 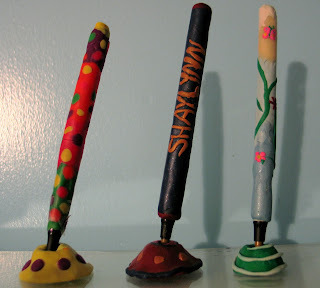 To make your thinner clay creations sturdier, paint over the peice with Mod Podge or another kind of glue. This will also work extremely well for gluing broken creations back together. My two year old brother smashed all of these pictured into at least three separate parts. Two coats of Mod Podge later, and you can't hardly tell they were broken. Also, for a more metallic, realistic look, coat with a glaze. I wore my Chase Buckle to a dance, and everyone thought it was metal and that I had bought it! 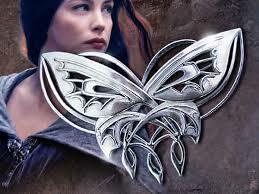 Arwen wore a butterfly brooch as a clasp on one of her many capes. 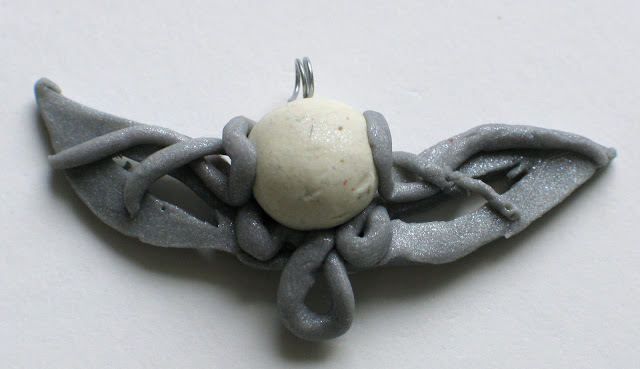 I made my own version by rolling out the clay, using a toothpick to cut apart the main pieces (the wings, etc), rolled up bits for the antenna and swirlies at the bottom, and used a toothpick to carve the designs on the wings. Mine is two inches wide. 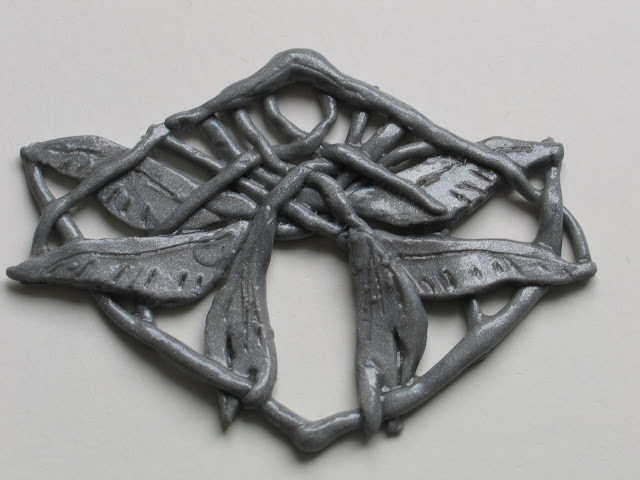 Galadriel wore a beautiful, intricate silver and mother-of-pearl brooch. Mine is all clay! I used the same techniques as above. to tell) on her Chase outfit. It was definitely confusing-- I realized that there are four "petals", two "leaves" and two "stems", with ends intricately wrapped and twisted around each other. My only suggestion, should you choose to attempt this, is to pay very close attention to the picture. Now, this one didn't turn out so great. I have been using the pictures that came in a little booklet inside our Lord of the Rings DVD. You know, the ones where they try to sell you all the coolest, most expensive trinkets related to the movies? This was called the "Eternal Star" or something. I couldn't find the same picture online. I spiced up the clay with some beads.